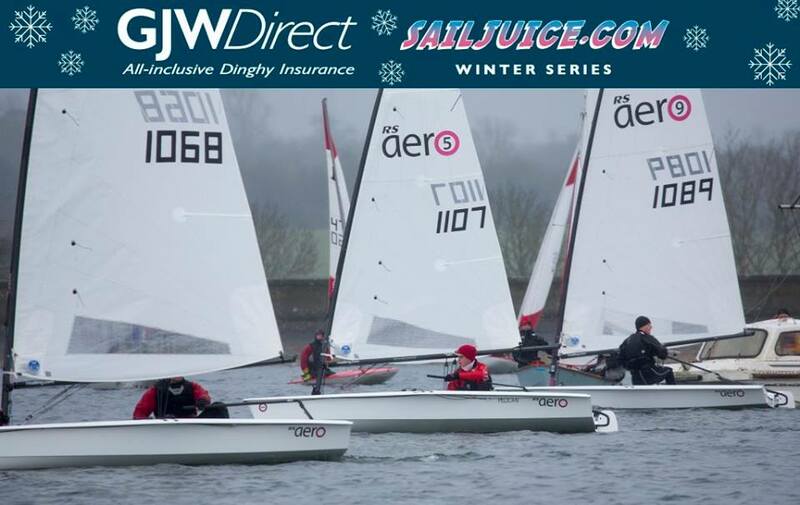 The RS Aero Class decided to make The Oxford Blue event of the GJW Direct SailJuice Winter Series their class Winter Champs and with up to 20 boats a week being delivered to owners at the end of 2014 they managed to round up an impressive 25 entries within 6 months of the first boats being delivered. The overall event reached its capacity of 150 entries, which is a record, and the Aeros were a whopping one sixth of that! With a variable forecast 17 of those sailors opted for the larger 9 rig which led to some great class racing whilst the smaller 7 and 5 rigs competed with them on a handicap basis. A bit of rain first thing didn't dampen the enthusiasm for the class’ first biggie. The 1st race was light and became a drifter. However, for the 2nd and 3rd races the wind piped up to a fun 12-16 knots allowing for fast planning on the reaches. The big rigs then became energetic at times but good fun and very manageable on the flat water. In the ‘RS Aero 9’ Ben Pickering (Chase), the 2014 Blaze National Champ, was right on it from the outset leading all 3 races. Peter Barton (Lymington) managed to mount comebacks to take the lead by the end of races 1 ands 2. Al Keck (Bowmoor) and Jamie Freeman (Oulton) were consistently battling at the front. Peter Townend (Chelmarsh), Matt Thursfield (Chelmarsh) and Anthony Lynall (Avon) all had appearances near the front through the day. Good competitive racing was spread throughout the fleet. Paul Robson (Reading) led the ‘RS Aero 7’ rigs overall and placed highly on corrected time against the 9s. 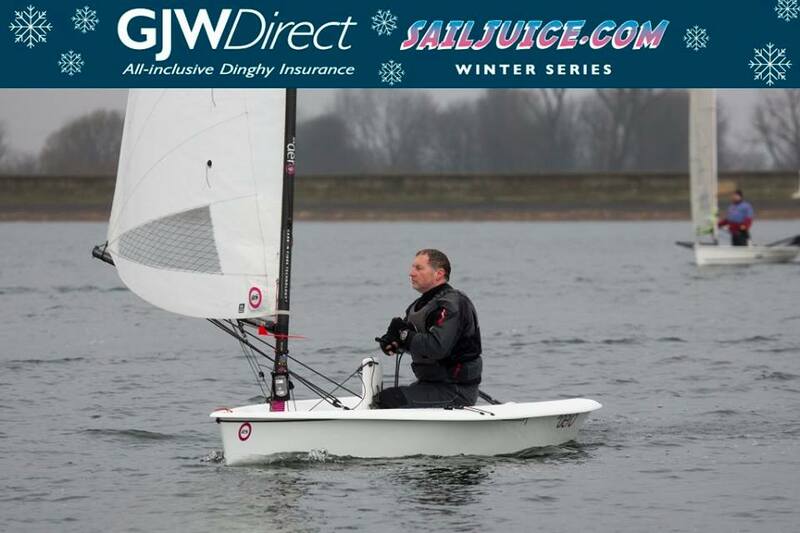 In the light first race, George Catchpole (Oulton), having only taken delivery in time for Christmas managed to win the 7s. Some of the most noteworthy achievements of the day came out of the ‘RS Aero 5’ rigs. Five dedicated weekends of RS Aero 5 training have been organized this winter in conjunction with the RS Tera squad. Already the ‘Aeronauts’ are looking very confident in their new boats across the spectrum. 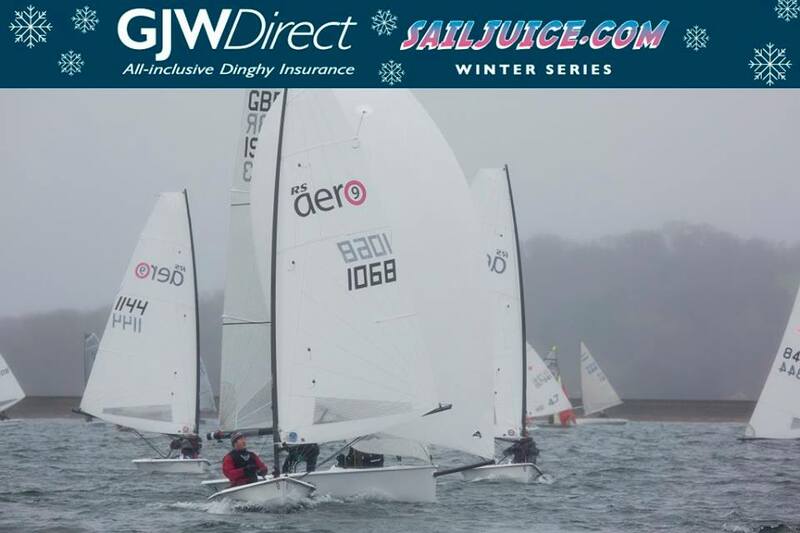 As the breeze piped up to 12-16 knots, Will Taylor (Royal Mersey) in his 'RS Aero 5' beat most of the bigger sailed boats from various classes in our start group to the first mark and was still well up at the leeward mark after 2 reaches and a run! SailRacer furnished all boats with GPS trackers. These really added value by being able to sort out complex results and produce interesting data and stats. With these everyone’s max speed of the day is recorded and can then be corrected by relevant Class handicaps. Incredibly, the fastest ‘snapshot’ handicap corrected max speed of the day was by an RS Aero 5 where Archie Hainsworth (RHS), a 13 year old weighing in at just 50kg, managed for a moment to plane his superlight Aero hull to record a (handicap corrected) max speed faster than any of the other 140 boats on the water! Last month at Hayling when a 35 knot squall came through in training Archie had a really tough time of it. Well done for smashing this one Archie!